Following the re-establishment of British authority at the Cape in 1806, the British found themselves increasingly drawn into the conflict between the indigenous peoples and the Boers. By 1810, the major confrontation was with the Xhosa on the Eastern Frontier due to the westward intrusion of the Xhosa who were still settled in the Suurveld. 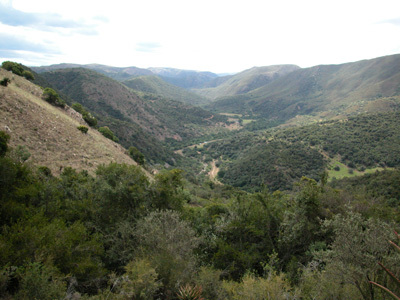 In October, 1811, the new Governor, John Cradock, resolved to clear the Zuurveld of the Xhosa, and to drive them back to east of the Fish River. He appointed Colonel John Graham to this task. By December, Graham had raised three forces. The southernmost was near the mouth of the Sundays River, while a second was in the area of Coerney near Addo. The third was a Commando from Graaff-Reinet, led by the Landdrost, Anders Stockenstrom. They were stationed north of the Zuurberg, to protect Bruintjeshoogte and Graaff-Reinet against Xhosa intrusions from the south and east. The commandos gathered at the mouth of the Sundays river crossed after Christmas in order to expel the enemy from the Addo bush. On 27 December Graham sent orders to Stockenstrom to join the other soldiers and burghers at Cuyler's camp at Coerney. Stockenstrom responded with about 24 of his men, who left their camp at sunrise on 28 December 1811 to travel south over the Zuurberg. Near the peak of the Zuurberg, Stockenstrom's party encountered a group of Xhosa of the Imidange clan, under Kasa, on Doringnek, the watershed between the White and Coerney rivers, in the Suurberg. The burghers wished to ignore them and proceed, but Stockenstrom, relying on his popularity as the friend and benefactor of both whites and Bantu, reined in, dismounted and went to meet them unarmed. In the course of a long conversation he spent half-an-hour endeavouring to persuade them to return to their country without bloodshed. During the conversation about a hundred of the Imidange surrounded the white men unnoticed, and when Stockenstrom remounted to proceed they were attacked from all sides. Stockenstrom, eight burghers and a half-caste interpreter were killed, and four men were wounded, although they managed to escape. Among the dead was Jan Christiaan Greyling, whose widow married Piet Retief, the future Voortrekker leader, in 1814; and Philip Buys who is believed to be "a Baster Hottentot" son of Coenraad De Buys and Elizabeth. Philip was, more than likely, acting as a guide and/or half-caste interpreter for the group. When the news of the murder of the landdrost and his companions reached the camp at Bruintjieshoogte; his son, Ensign Andries Stockenstrom, together with eighteen mounted burghers, hastened to Doringnek, where they surprised a number of the murderers, shot thirteen dead, and recaptured eight horses.